Open dialogue Selection files. You can add KML or KMZ files for the selection of the area of interests (AOI). You can use points, lines and polygons. All results of the work of program will relate only to the selected region. 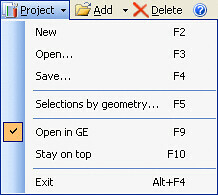 You can add folder into project tree. Superoverlay supports one level of folders only. 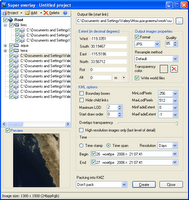 Folders need for group operations with images. If we set the parameter for Folder that this parameter automatically will be set for all elements of group. We can set parameters to Project (all objects) also. Alt (optional) specifies a altitude of the overlay. You can select units of altitude from list (m, km, ft, mi). We use new overlays feature of GE 4. If you check this option then results include hi-res images only.